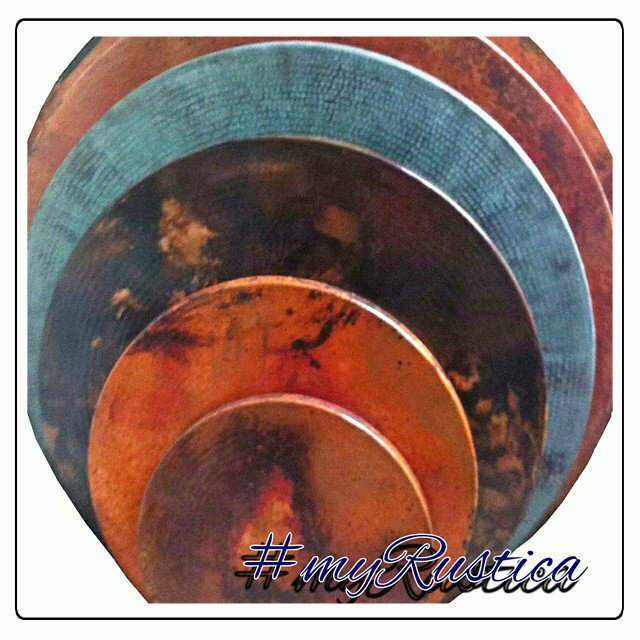 Click the button below to add the Round Copper Tabletop "Rustic Dark" to your wish list. One-of-a-kind copper table top with partially rusted dark finishing. This rustic table top can be used for kitchen, dining, living room and veranda. You can either add your own base or purchase any Rustica House design and have them shipped together at the discount price. The tabletop is made of particle board covered with hammered copper. Product page photo may show slightly different looking furniture than you are going to receive as the dark and light rustic areas are random. No two identical table-tops are possible to produce. Custom production of copper table-tops, kitchen bathroom hammered counters and rustic backsplash walls.